One of our readers has commented that small spaces do not mean un-livable or not conducive for family living, since people & families are still living in a 1- and 2-room HDB flats (which are considered "shoebox" HDB-style) in Singapore. This got the wife and I really curious. So we decided to find out for ourselves how big (or small) the HDB 1- and 2-room flats actually are. Scouring the HDB website, we discovered that a typical early 1-room HDB flat was between 23 to 33sqm (= 247 - 355sqft), while the early 2-room HDB flat ranged from 37 to 45sqm (= 398 - 484sqft). · The HDB flats do not come with disproportionately large air-con ledges, planter boxes, balconies etc etc that are regular features in most shoeboxes. So the 300sqft, 1-room HDB flat actually comes up top in terms of "livable space" compared to a shoebox of similiar size. · The price that people pay for such HDB flats are many times lower than your typical shoeboxes, whether in terms of quantum or psf price. However, one can argue that the quality of living (i.e. facilities, privacy etc) is different, which we don't disagree. · Most importantly, people and families do not typically choose to live in such small 1- and 2-room flats. These are mainly occupied by low-income households, who cannot "downgrade" any further in terms of the types of homes they can afford to buy. But for shoebox purchases, this is usually a deliberate informed decision. 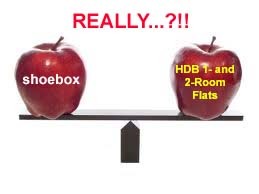 6 comments to ''Shoeboxes = HDB 1- and 2-Room Flats?" My current family home is a 3-room HDB flat which is approximately 740 sqf. Before that, we were in a 1-room rental flat. Just bought myself a 650 sqf unit in a new development this year which Iove. Did I have any other choice? No. The current policies mean that I cannot buy an HDB flat (not even a resale one) until I'm 35. But I'm already 30 this year and with no plans of marriage in the next couple of years, the alternative would be staying cramped in a flat with 3 other adults sharing 740 sqf. Yes, it may seem tiny compared to the 1000++ sqf units that most Singaporeans grew up in, but for me, 650 sqf is plenty space for one. Heck, even a 400 sqf unit will be more personal space for me. To this end, I do not agree that people who live in shoebox units choose to do so - it is for lack of choices that they do so. Small units in private developments have their purposes; it will be good to get perspectives right before dissing them. Yes indeed, shoeboxes be it HDB or condo have their purpose... Folks@proptalk, your family may be living in a 1600+sqft big & pte space, but don't be a frog in a well to say that any space below 600sqft is unlivable or not conducive for family living! Coz there are and have been families who grew up in such small spaces. Its good to hear everyone's open and frank opinions. Please let's keep discussion open. Thanks Folks@Proptalk. Your discussion thread has opened this topic and everybody is wiser. I enjoyed your blog and continue to be.